Internal Hard disk or hard drive is one of the most important components of your computer. It is the place where the operating system resides and you store all of your data. It is the main storage unit of your computer whether it is a PC or Laptop. A desktop hard disk is identified as 3.5 inch HDD width whereas a laptop hard disk is slimmer and is identified as 2.5 inch HDD. Here we talk about the mechanical hard disks for desktop PC and not the SSD or Solid State Drives. SSDs are expensive and are not available in large capacities. Solid State Drives are considerably faster than the traditional mechanical hard drives. They are only useful for storing operating systems so as to make your computer performance faster and decrease boot time. Mechanical hard drives are cost effective and are available in huge capacities to up to 8TB or more. Their performance has increased considerably over time because of the use of better technology and also due to faster and higher cache memory. Seagate and Western Digital (WD) are the two most popular companies that make hard disks and other storage products. Here in this post I will list down the best internal hard disks for your desktop PC. Here are the best desktop internal hard drives that you can find in India. If you are purely looking for performance then WD Black HDD is one of the best desktop internal hard disks that you can find in the market today. It is a high performance hard disk that is made for gaming and high-end performance desktop systems. Below are the popular models for the WD Black hard disk. WD Black Internal Hard drive comes with large cache memory of 128MB and drive speed of 7200 RPM for fast loading times and data access & write. The Dynamic Cache Technology (DCT) enables the drives to have faster read and write times. The hard drive comes with dual core processor to maximize the performance. The WD Black hard drive is a bit noisy and consumes more power than the others but its performance is really top notch. 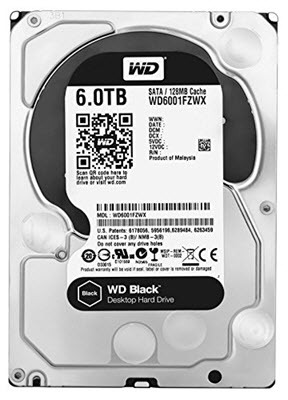 So if you are a hardware enthusiast or a gamer and want a fast & reliable high-speed hard drive for your PC then WD Black is perfect for you. Note: You will require better SMPS for such power hungry hard drives. Western Digital Blue hard drives are one of the best PC hard drives available in the market today. It is one of the most preferred hard drives by the users because of its reliability and price to performance ratio. Western Digital Blue hard drive delivers very good performance and is not expensive either. You can either use as the primary boot device or also as secondary storage drive in combination with SSD. They are not noisy and consume less power as compared to the WB Black hard drives that are very noisy and consumes lot of power. WD Blue hard disk is available in capacities of 500GB, 1TB, 2TB, 3TB, 4TB, 5TB, 6TB and in two different RPM speeds of 5400 RPM and 7200 RPM. Below are the various models and specifications of the WB Blue hard drives. WD Blue Hard Drives are perfect for a normal desktop PC. You may also use it for your gaming PC too if you are on budget and cannot afford the WD Black hard drive. Seagate BarraCuda is the most widely used and popular drives available in the market. They are very reliable and deliver high performance. This hard disk has spin speed of 7200 RPM and uses Multi-Tier Caching Technology (MTC) for very fast read and write speeds. You can use this internal hard disk for normal usage as well for gaming purpose. If you want more performance then you may go with Seagate BarraCuda Pro which is an edge above the normal Seagate BarraCuda hard drives. Seagate Barracuda hard drives are available in capacities of 4 TB, 3 TB, 2 TB, 1 TB, 500 GB with 16 / 32 / 64 MB cache. The hard drive is not very expensive and can easily fit into your budget. So if you are looking for a fast, reliable and widely trusted internal hard drive for your desktop PC then you cannot go wrong with this one. Seagate Desktop HDD is the most affordable hard disk from Seagate. These basic hard drives are meant for budget conscious users who want decent performance at a lower price range. 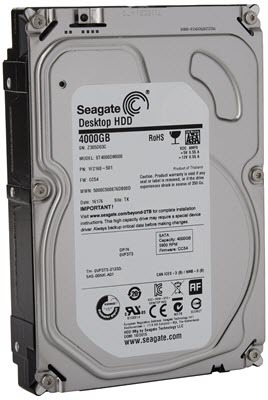 Seagate Desktop HDD hard disks are available in capacities of 500 GB, 1 TB, 2 TB, 3 TB, 4 TB, 5 TB, 6 TB, 8 TB. The hard disk is very silent in operation and requires less power for its operation. It is well suited for an average desktop PC and can be used as secondary storage in combination with SSD in high-end or gaming PCs. WD Caviar Green hard drives are one of the most silent and lower power consumption internal hard drives that you can get for your desktop PC. These hard disks have lower 5400 RPM and they also run pretty cool. All these factors are responsible for the longer lifespan of WB Caviar Green hard drives. They are not meant for gaming or for high-end PCs but are suitable for users who want an Eco friendly, reliable, silent and a hard drive that consume less power. I have listed down the best budget internal hard disks for desktop PC for both gaming as well as for normal usage. If you have any queries or are confused about which internal hard disk to buy for your PC then you can ask me by leaving a comment below. Hello, Sir i have g41d3lm motherboard that supports interface 3 Gb/s . 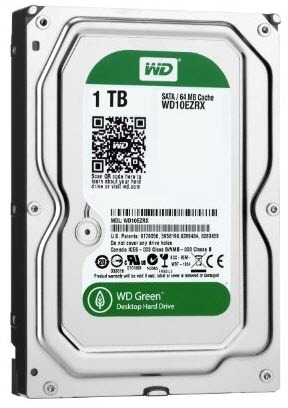 i bought a WD Caviar Green 1 TB hard disk .Any problem comes if i connected to motherboard . i know that data speed comes slower .My question is Any fault or defects of hard disk comes ? No there will not be any issues with the hard disks and it will work fine. Hi, Akshat sir which CPU is very best for buy at low priçe like Rs.5,000 & 10,000 please tell me sir !!!! Im not asking a processor im asking a new desktop CPU for Rs.5,000 & 10,000 for best gaming and projects. There is no way you can build a gaming CPU under 10000. Well i don’t have or seen any. Can we use it as normal HDD like WD Black or Blue. you are requested to kindly review it and how can I use a 3.5″ HDD as external HDD. So I can connect 4 HDD/SSD with motherboard, right. but capacity not mentioned for connectors like mentioned in RAM case. How to know the maximum size of HDD/SSD supported by my motherboard/processor i.e. 2TB, 3TB, 4TB or so on in one Connector? Means it can support more than 2tb hdd with GPT partition style. Sir i need a help.recently i build a pc and installed windows 10.it was running fine.today i replaced my smps coz it was not providing sufficiant output volatge so i detached all the cables from mobo including sata cables.and now i forgot in which port my hard drive was connected.i am confused which port to connect! !the mobo is gigabyte b250m-d2v which has 5 sata ports(0-5).which port should i connect my hdd which is preinstalled windows 10 pro x64….or i need to reinstall the os again? ?plz help me sir and in which port i connect my dvd drive????. Connect to any port as it does not matter but make sure that in BIOS your first boot device is the HDD. Can u plz tell me that how to check about which is my first boot device!! Please consult your motherboard manual for that. I Want to buy 2TB HDD. I do Animation work. My Purpose is that. I have Two Computers at my home. So in This 2tb Harddisk (in 2nd Computer) I want to Store all my Library. And that library I need to access form my 1st computer while doing my work or while doing the rendering. So please suggest me which HHD should I buy? which will give me best speed while accessing on LAN? Thank You. Awaiting ur Reply ASAP. 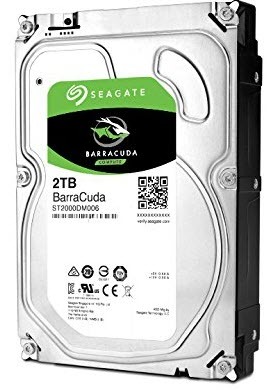 I suggest you to go for Seagate Barracuda 2TB Hard disk. It is a 7200RPM HDD and is one of the fastest 2TB hard drives in the market right now. Sir which HDD is best for my PC ? 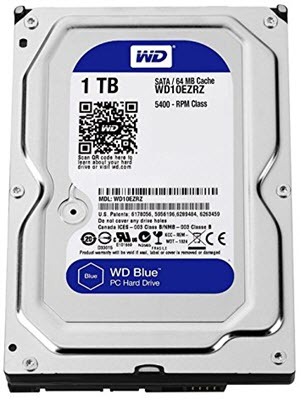 Go for WB Blue 1TB HDD. Hi Can I use a laptop HDD for a Desktop PC? But… Laptop uses only +5v and desktop SATA has +5v and +12 volt . The +12v will damage my hard drive right? Then should I just cut the +12v rail (Yellow Wire) alone with one of the ground wire (black wire) ??? So do I have to cut my yellow and black wire? If it is SATA drive with regular connectors then dont worry about volts. Which brand hdd is best for keeping personal data safest for longest time in 4 to 6 tb variant and internal or external, plz suggest also, thank u very much. Both WD and Seagate are good but I prefer WD over Seagate. I recommend you to get a WD external HDD 1TB. thank u very much, but if i would like to purchase 4 or 6 tb internal desktop 3.5″ hdd then which i should to be purchased. WD or Seagate, both are good. Buy whichever is cheaper. note:my pc is 8 yrs old. Which SMPS are you using? Sir sorry for the delayed reply. You need to change your SMPS. I suggest you to go for Corsair VS450. hello sir as you said i am ready to go with corsair vs450 watt smps ,but before that i have some doubts sir…My system manufacture is ECS model is (G41T-M7) mother board and zebronics cabin and cabin’s model is yuvraj, are they support corsair vs450, if they support then there is two corsair vs450 available in amazon old 2017 model and new 2018 model which one is best and pls share that link or otherwise is it ok for buy in shops directly. I think it is 8-pin (4+4) that can be split. yes sir you are correct, now it’s fine ..
Hi Akshat… First of all Thanks for this article…2 months back I have build new computer….. I don’t know why it is happening 🙁 totally frustrated…. Can you please tell me whether my hard disk causing this ??? Can you tell me which Power Supply (PSU) are you using? Please provide me its details or model number. Can you tell me how much current does it have under the +12V rail? Is HP S600 240GB is good ??? I don’t trust HP when it comes to SSD. Better to go for Samsung, WD or Kingston.